Paulouski sued the chief prosecutor of the Mahiliou region Siankevich because of his insulting expressions at the TV debates during the parliamentary election campaign, when the both of them were running at the election constituency #85. In particular, the prosecutor stated that Paulouski was a social parasite, being unemployed. Moreover, he factually accused Paulouski of telling lies by stating that no walls had fallen down during the construction of the "IKEA" furniture plant, though Paulouski showed a photo of the ruined wall to the audience. Then the prosecutor of the Mahiliou region Eduard Siankevich said: "You can show any photos you want – but they are not confirmed by specialists". Paulouski claimed a compensation of 10 million rubles from Siankevich. He also asked the court to reverse the verdict of the court of the first instance, abolish the groundless doubling of the court fee (he had to pay 600,000 rubles instead of 300,000) and oblige the defendant to offer public apologies on the air of the TV channel "Belarus-2". The trade union activist also asked the court to oblige the regional prosecutor's office to hold a new investigation on the fact of the failure of the wall during the constructing of the "IKEA" furniture plant on Shmidt Avenue in Mahiliou, punish the guilty and give a written answer to him and the British businessman of the Belarusian origin Aliaksandr Minin. As stated by BelaPAN, Mr. Minin addressed the Federation of Trade Unions and the Mahiliou Region Executive Committee in summer, and these institutions confirmed the failure of the wall from wind. Paulouski's appeal was considered by the judge Stelmakhova. The court did not grant the appeal, but abolished the doubling of the court fee. According to the human rights defender Barys Bukhel the judges conferred for quite a long time before pronouncing the sentence – 45 minutes instead of the usual 5-10 minutes. It's worth mentioning that an activist of the Trade Union of Radio-electronic Industry Aliaksei Paulouski has been unemployed since the beginning of the year. The building organization "Pramzhylbud" did not extend his labor contract because of his activities on protection of labor rights. He tried to get employed for more than 20 times with the assistance of the social employment center, but faced insurmountable obstacles. The failure of the wall of the "IKEA" furniture plant in the night of 12-13 July 2012 was confirmed many times, including by the Federation of Trade Unions of Belarus, officials of the regional executive committee and the head of the plant. 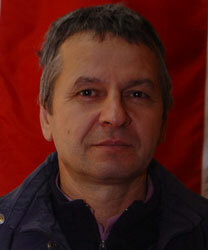 The chief engineer of "Pramzhylbud" Siarhei Kalasouski also confirmed this fact in an interview with the BelaPAN. Photos confirming this fact appeared on the web. However, the prosecutor's check-ups and the courts ignore this fact. That's why many questions remain to be answered: such as why the state control institutions don't want to see evident things and why the fact of the wall failure was not registered as an incident.